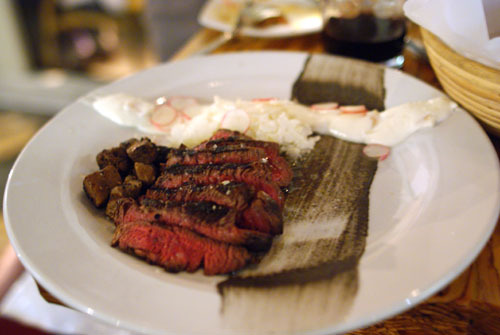 Ludo's Last Stand: August 22 marked the end of chef Ludovic Lefebvre's "guerilla style pop-up restaurant" concept LudoBites, which aimed to serve haute cuisine at everyday price points, bringing Rue Varenne to Main Street, in a sense. The series ran from May 19, and over the past several months, has proven to be an unmitigated success, winning the hearts and minds of legions of LA bloggers and Twitterers. Given LudoBites' immense popularity, I figured that the last dinner would sell out, and thus made sure to make reservations early. Joining me in my party were Christine of Folie à Choisauce, Danny of Kung Food Panda, Fiona of Gourmet Pigs, and Ryan of Only Eat What Feeds Your Soul. Other notables in attendance included: Connie of Hey Hey Scenesters!, H.C. of L.A. and O.C. Foodventures, Jo of My Last Bite, Sam of LAist, Sarah of The Delicious Life, Sook of Yutjangsah, and The Active Foodie. I also spied Eli Sussman of Freshman in the Kitchen, well, in the kitchen. To read more about and Ludo and LudoBites, please refer to my first post about the place. The restaurant upon arrival: Overestimating traffic, I ended up coming 30 minutes early. The place was still relatively serene at this point, but would turn absolutely buzzing by the end of the night. 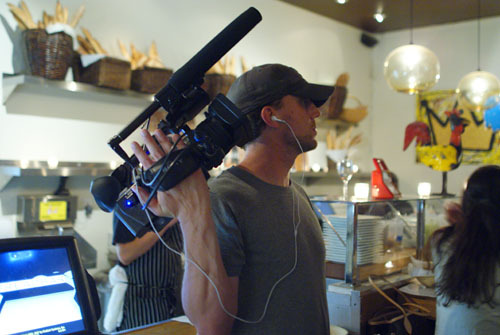 There was even a camera crew on site, capturing the drama of the last night of service. 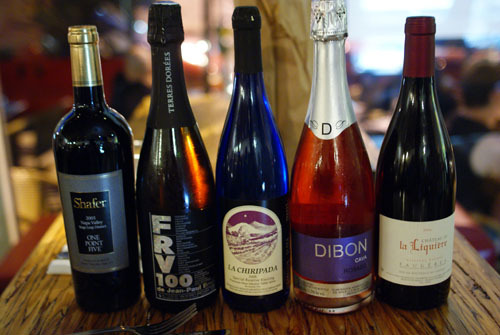 LudoBites is strictly a BYOB experience, and although corkage is officially $5, we've never been charged for it. This time, we brought, in the order consumed: NV Dibon Brut Rosado (Christine), 2008 La Chiripada Riesling (Fiona), 2005 Château de la Liquiere Faugères Vieilles Vignes (Ryan), 2005 Shafer Cabernet Sauvignon One Point Five (me), NV Domaine des Terres Dorées FRV 100 (Danny, had this one at Church & State as well). LudoBites' menu has always been ever-changing, ever-responsive to local ingredient availability, customer feedback, even Ludo's mercurial whimsy. And yes, in true kevinEats fashion, we just had to order everything on the menu, save for two items that were sold out: Lobster Medallions Honey Sherry Vinaigrette Rosemary [$18] and Fish & Chips with Peanut Crust Kimchee Honey Beer [$20]. On my first visit here, I had a similar dish called Chorizo Onions Cornichon. 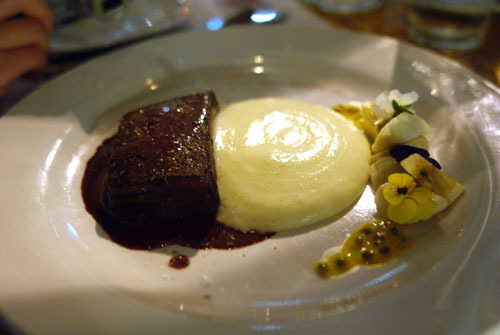 It was one of my favorites of the meal, and again, the version this night proved to be a strong start as well. 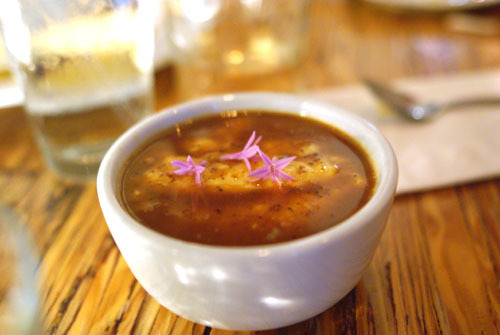 It was a cold Spanish chorizo soup, replete with cubes of cantaloupe and an island of cornichon granita. The soup itself was something else, absolutely imbued with the essence of chorizo--its smokiness, its savoriness, its lingering spiciness. The "gazpacho" perhaps would've been too overpowering on its own, so I appreciated how the tangy "slush" and sweet melon mitigated the unabashed saltiness of the sausage. The first word that came to mind upon tasting this dish was "bracing." 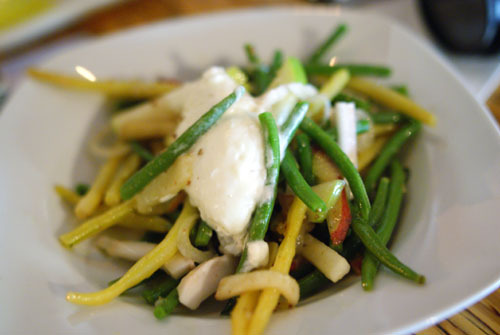 I liked the snap, the crunch of the green beans, their innerving vegetal tang. On the midpalate, their flavor was joined by the lightly spicy horseradish mousse and sweet peach, while the finish was distinctly tinged with the smack of lemongrass. I'm a big fan of tartares, but I don't think I'd ever encountered a veal version before. In a sense, this was Ludo's reimagination of the traditional Italian dish vitello tonnato, a preparation of sliced veal in a tuna-flavored, mayo-like sauce, served cold. 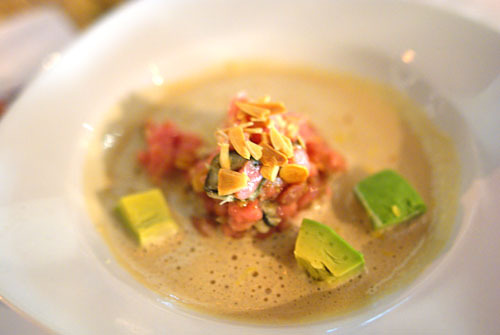 As usual, the veal was quite mild, so I appreciated how it was tarted up by the application of the briny oyster, creamy avocado, tart lemon, and of course, the rich tonnato sauce. The almonds, meanwhile, provided a great crunchy textural element. Next was a dish that everyone seemed to enjoy. 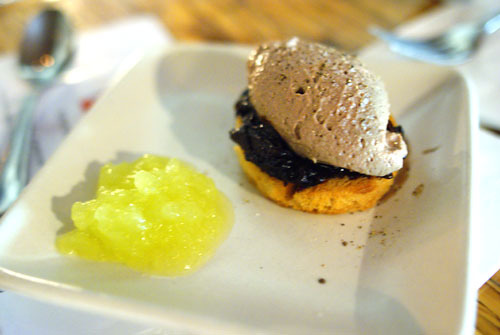 Looking somewhat like a quenelle of ice cream was a delightful chicken liver mousse, which had a flavor not unlike that of foie gras--rich, distinctive, a touch gamy. The brioche was instrumental in balancing out the liver's intensity, while the green apple added a bit of sourness to things. 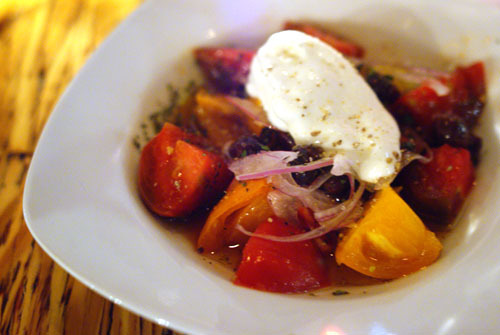 This was basically Ludo's take on a Greek salad. It was fairly straightforward, with a base of sweet, luscious pieces of tomato, tangy onion, tart olive, all dressed in a salty, vinegar-y marinade. The key to this, thus, was the feta, reinvented here in a mousse form. This made for a creamier, milder cheese, one which I preferred to standard feta. 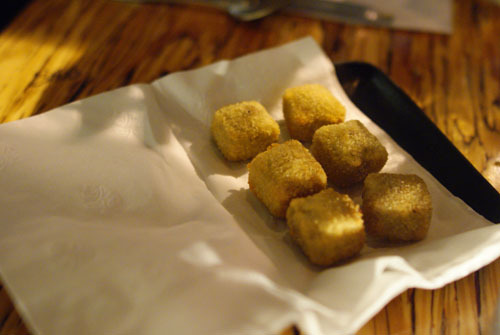 Tucked in a napkin came these six innocent-looking cuboids. They were far from innocuous though, as each one burst instantly upon mastication, releasing a wave of liquid foie gras in the process. 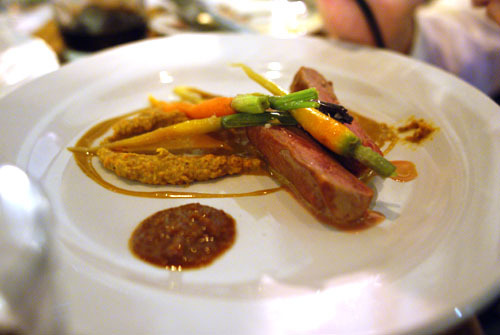 The foie's flavor was actually surprisingly mild, and was mitigated by the crunchy, savory exterior layer. A fun course. Ludo once tweeted that no one was ordering this dish; given that boudin noir is pork blood sausage (a somewhat scary description perhaps), I can't say that I'm too surprised. But really there was nothing to fear. Though it looked like a soft chocolate pudding cake, its flavor was just like sausage initially; it was only on the finish that the slightly metallic tinge of blood made itself known. And if that's still too much, the potato and banana were there to simmer things down. Makes me want to have some soondae! Polenta is pretty much boiled cornmeal mush, and it and I have never gotten along; as such, I was a bit surprised when I actually liked this dish. The first thing that struck me was the texture, which was creamy, smooth, yet gritty enough. 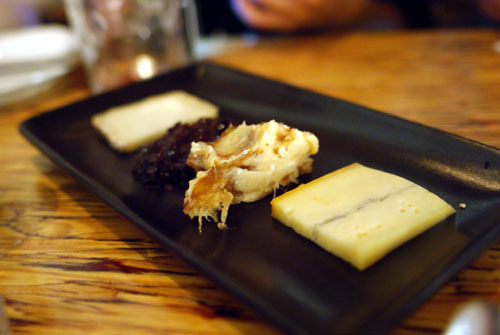 Flavor-wise, I enjoyed the use of Cantal, a semi-hard cow's milk cheese from the Auvergne region of France. It had a strong, cheesey flavor that really complemented the mild polenta beautifully. The use of truffles took things to an even higher level, though I would've liked even more. At this point, we got an infusion of booze. 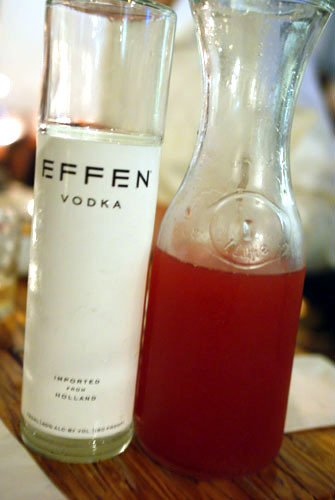 First, Jo brought over some Effen Vodka, mixed with fruit juice. 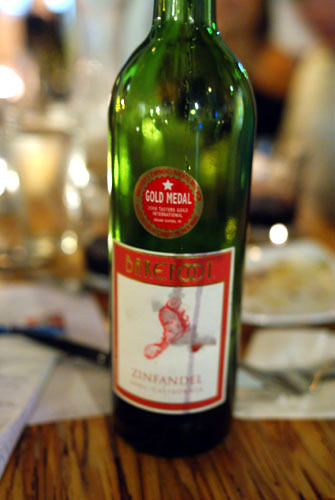 Next was the NV Barefoot Cellars Zinfandel, courtesy of Sam Kim's table (I later found that this, too, was originally from Jo). Thanks guys! 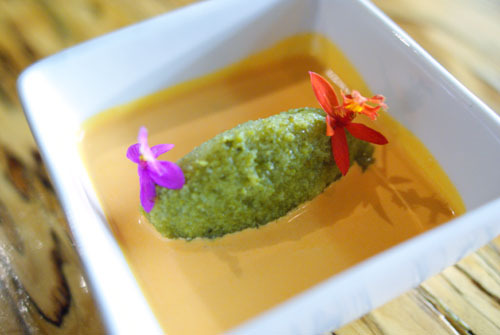 Now this is one dish that has been all over the blogosphere. 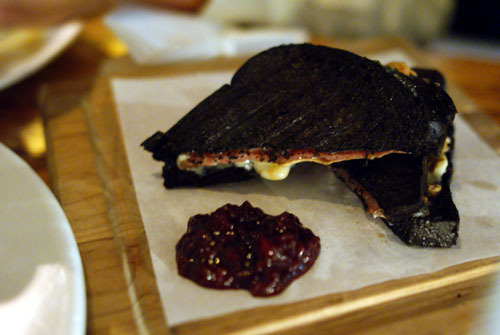 A standard croque monsieur is basically a grilled ham and cheese (Lamb Chopper sheep's milk cheese, in this case) sandwich; Ludo's interpretation, however, adds duck foie gras and a cherry-amaretto compote, while soaking the brioche in squid ink. I was a bit afraid that the foie would dominate here, but rather, I was able to appreciate the ham and cheese elements, while the foie actually tied everything together, providing an almost supporting role. I could've gone either way on the jammy sauce though. 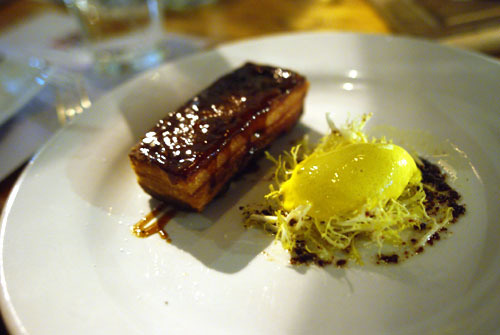 For me, pork belly can be very hit-or-miss; fortunately, this was mostly a hit. The belly itself was a bit fattier than I prefer, with a delightfully crunchy skin, while the flavor was quite sweet, with a somewhat Asian-inspired sapor in fact. It would've been overwhelming on its own, but the frisée and tangy ice cream worked wonders in cutting the gravity of the belly. Our lovely server, Daria. Note the dangling "Hottie Whistle," provided by Jo. Ludo's ducks and I do not get along, apparently. During my last LudoBites meal, I noted that the duck was far too sweet; I'm afraid that I had to come to the same conclusion here. Almond was the offender last time; this time around it was the carrot cake coulis, which stole attention away from the duck's intrinsic savor. Fortunately, the veggies did temper the sugariness somewhat. No surprises with the beef: it was cooked to a lovely medium-rare temperature, suitably tender, with a nicely charred crust. The smokiness of the eggplant really made itself known, but I didn't get much of the sesame. Duck fat rarely disappoints, and this was no exception. 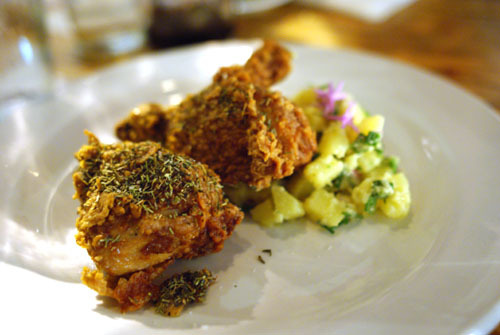 It may have been the best fried chicken I've had in fact: juicy, tender flesh with a rich, hearty, positively delectable flavor, perfectly accented by its crispy herb-encrusted skin. The potato salad, meanwhile, was properly tangy, a fitting foil to the bird. Gimme a whole bucket please! The fromage course has been downgraded significantly from the five-selection, $35 plate previously offered. Unfortunately, given the hectic pace of the evening, I wasn't able to catch exactly what cheeses were presented, though I do recall mention of a goat cheese and a mozzarella, served with date butter. The line of ash in the cheese in the foreground does make me think of Morbier (usually made with cow milk), however. Our first dessert was a dish developed by Ludo during his stint at Bastide: crème fraîche panna cotta, topped with a quenelle of caviar, in a sea of caramel. The amalgam of caramel and caviar worked surprisingly well, resulting in a sensation not unlike that of the Butterscotch Budino at Pizzeria Mozza. 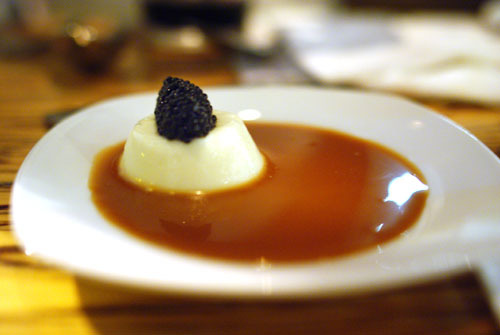 The panna cotta, thus, took more of a supporting role here, with the caviar-caramel complex stealing the show. Now here's another item that's been all over our blogs and tweets. 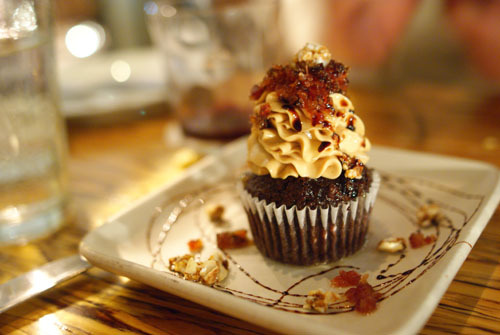 The cupcake alone was strictly by-the-book: dense, sweet, moist, chocolate-y; the items of interest were clearly the toppings. The experience of eating this, quite simply, was a touch disconcerting, with sugary and liver-y flavors vying for my palate's attention. I'm not sure which won out, but the monolithic nature of the cup cake was justly accented by the luxurious Chantilly. The candied bacon and almonds did tie things together, making for a dish that straddles the line between a sweet and savory course. Following was another dessert that also had some marked savory components to it. 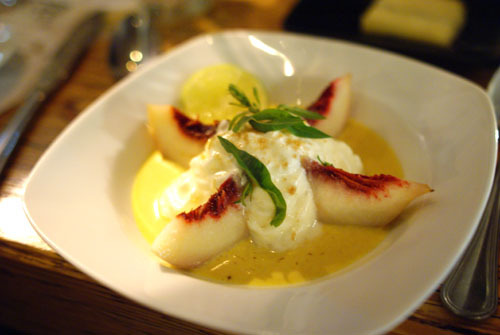 Here, I initially tasted the lush, juicy sweetness of the peach, but this then transitioned to the delicate, ethereal creaminess of the mascarpone, accented by a light tang from the verbena. The curry was the most intriguing element here, and made itself known on the late midpalate, giving things a bit of fire in the process. This was arguably the most conventional of Ludo's desserts. 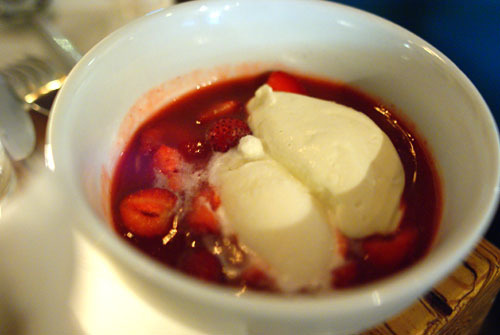 The soup was thick with the saccharine essence of strawberry, so the application of the marshmallow ice cream really lightened things up, tempering the overt sugariness of the berry. I couldn't really taste the wasabi, however. So with that, we come to the end of an era in LA dining. Fans need not fret however; the Ludo saga isn't over yet, as it seems that he and Krissy are working on finding a permanent home. It'll be interesting to see how and if "LudoBites" will change when it's no longer "pop-up," but I do have high hopes for Ludo becoming a fixture on Los Angeles dining scene--we're ready this time around. With any luck, he'll be able to achieve in his own place what he never could at Bastide, surely securing more than a singular star from Sherry in the process I would hope. Bon courage M. Lefebvre! great descriptions as usual~ among them all, which one is your favorite? Hah that bottle of wine was originally from Jo; she gave it to Kristine who gave it to us. I figured you'd have some better wines on you but we didn't want it to go to waste. Nice meeting you. What a fun evening eating, drinking and partying with everyone (thanks for not posting drunk pictures by the way!). My favorite was the Fried Liquid Foie Gras. Can't wait for Ludo's next location. I say, whoever finds out first makes a reservation for 20! So we don't miss it. Hi there, just wanted to say thanks for your great site :) It's because of your first Ludobites review that I made reservations there for a recent trip to LA. SO glad I did, but I had to miss out on Orris to do it. Next time! Shelley: Thanks. My favorite item was probably the duck fat chicken. Have you been? Sam: Heh I'll be sure to amend my post with that little tidbit. Nice meeting you too (finally!). Jo: You know we're going to be taking over the place on the new restaurant's first night! And thanks for the wine and Effen. Where do you like to go for soondae? Good question Yena. Only had it one or two times, and I don't even remember where. Where do you like? Hm..there are several places to eat soondae in LA and around the LA area, not to mention you also have the choice to buy soondae from Korean markets as well. And they also all taste slightly different - I think you could call the discrepancy a variation in texture, from silky to gritty, gritty being at the more rustic end. I think a lot of Koreans take pride in how much they enjoy eating the rustic versions. Having said this, I live about 10 minutes away from the Seoul Soondae in Artesia (which serves the silky version of soondae), and it happens to be my favorite. Ah thanks for the info Yena!